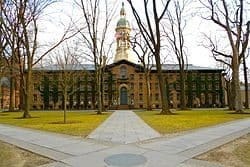 Princeton University and the town of Princeton announced on their websites this afternoon that the school and the town of Princeton have reached a seven-year payment in lieu of taxes agreement. For 2014, the school’s voluntary unrestricted contribution will be $2.75 million, an increase of $275,000 over the 2013 payment. In each subsequent year of the agreement the university will increase its contribution by four percent. – $250,000 toward construction of a new storage facility for the town’s department of public works equipment. – $500,000 toward construction of a new Princeton First Aid and Rescue Squad facility on municipal land. – $250,000 toward the expansion of the Witherspoon Fire Station (in addition to $300,000 already committed to this project under a prior agreement). – $500,000 toward the purchase of fire-fighting apparatus. Princeton University will also donate to the municipality for its use the university-owned parking lot on Franklin Street that has been valued in the range of $1 million. Princeton University Vice President and Secretary Robert Durkee and Princeton University Director of Community and Regional Affairs Kristin Appelget represented the university in the discussions that resulted in the agreement. Princeton University President Christopher L. Eisgruber participated in the initial meeting between the representatives of the University and the town. The town of Princeton was represented by Council President Bernie Miller, Councilman Patrick Simon and Administrator Bob Bruschi. Eisgruber said the conversations identified a number of specific projects that are important to the university as well as to other residents of this community. In addition to the contributions described in the agreement, the university makes additional payments each year by following a longstanding practice of leaving certain properties, such as non-dormitory graduate student housing, on the tax rolls, even though they could qualify for exemption from property taxes under New Jersey law. In 2013 the university paid $2.98 million in taxes on properties that could qualify for exemption, with $659,000 going to the town of Princeton and $1.43 million going to the Princeton Public Schools. The agreement indicates the university’s intent to continue this practice, and its intent, if it modifies this practice, to make additional voluntary payments to the municipality and the schools at the levels they would have received if the properties had remained on the tax rolls, school officials said. The university’s total property tax payment in Princeton in 2013 was $8.35 million, with $1.85 million of that total going to the town. The university’s property tax payments are expected to increase significantly in future years when its Lakeside graduate student housing and Merwick/Stanworth faculty/staff housing projects are completed. This agreement (the “Agreement”) is entered into on this 28th day of April, 2014 between Princeton, a municipal corporation of the State of New Jersey, having its principal offices located at 400 Witherspoon Street, Princeton, New Jersey, 08540 (hereinafter referred to as “Princeton” or the “Municipality”) and the Trustees of Princeton University, having its principal offices located at Nassau Hall, Princeton, New Jersey, 08544 (hereinafter referred to as the “University”). WHEREAS, this Agreement is further entered into in recognition of shared interests of Princeton and the University and in a spirit of mutual consent and it is separate and apart from any other agreement or action or request for action involving Princeton and the University. These contributions are intended for the unrestricted use of the Municipality. Half of each year’s payment shall be made no later than June 30 of each calendar year and the second half shall be made no later than December 15 of that same calendar year. In connection with the fact that the University assisted the Municipality in inaugurating the Free-B program, and in order to cover the cost of replacing the first Free-B vehicle, the University agrees to contribute $90,000 to the Municipality in 2014 for the purchase of a new Free-B vehicle. The foregoing contribution is in addition to the contribution described in Section 1 of the Agreement and in addition to the $500,000 that the University has already provided to the Municipality for the Transportation Trust Fund. It is expected that the Identified Projects will be initiated at various times during the seven-year term of the Agreement. Throughout the term of the Agreement, representatives of the University and the Municipality will meet from time-to-time to discuss, in good faith, the expected initiation of the Identified Projects, and the timing of the associated University contributions. If the Municipality decides to (i) not go forward with, or (ii) substantially delay, any of the Identified Projects set forth in clauses (a), (b), (c) or (d) above, representatives of the University and the Municipality will meet to identify an alternative, similar-sized project of mutual interest that might be substituted for the cancelled or substantially delayed Identified Project. Following recommendations from such representatives, the University and the Municipality will seek, in good faith, to modify the list of Identified Projects, so that the Municipality will continue to receive substantially comparable value from the University on a substituted project. Alternatively, if initiation of any of the Identified Projects set forth in clauses (a), (b), (c) or (d) above is expected to commence sometime within a three-year period after the end of the Term (i.e., within three years after the Agreement expires in 2020), the University’s commitment to fund such Identified Project in the amount set forth above will extend until the initiation of such Identified Project, unless the University and the Municipality agree otherwise. For the avoidance of doubt, this paragraph does not apply to the donation of the lot on Franklin Street, as set forth in clause (e) above. For many years the University has followed a practice of leaving certain properties on the tax rolls even though these properties could qualify for exemption from property taxes under New Jersey law. The University has indicated its intention to continue this practice during the Term. If the University modifies this practice during the Term, it has expressed its intent, for the remainder of the Term, to make annual voluntary payments to the Municipality and the Princeton Public Schools, in addition to the payments set forth in other sections of the Agreement, that would be equivalent to the amounts that the Municipality and the Princeton Public Schools would have received in connection with these properties if they had remained on the tax rolls. Starting in the first half of 2019, the parties will endeavor, in good faith, to enter into a new agreement regarding University contributions to the Municipality in years following the end of the Term. The Agreement will be subject to the laws and regulations of the State of New Jersey. There is no waiver of legal rights except as specifically set forth in the Agreement and the Agreement is for the sole benefit of the parties and their successors and assigns.